An award-winning filmmaker and editor, Michael is a graduate from the School of Film and Digital Media at UC Santa Cruz. Michael has directed a number of short films that have screened at such as prestigious festivals like The Festival De Cannes (American Pavilion), Chicago and SlamDance. Some of Michael's most prolific work has been as an editor and he was the lead editor of the Sundance award-winning feature documentary film, FUEL in 2008. That film was short-listed for the Academy Awards in 2009. Michale's next editing project was the high-profile docudrama, BHUTTO, which also premiered at Sundance in 2010. In addition to editing, he also directed several narrative sequences in the film. Next to narrative and documentary projects, Michael makes his living as a producer and editor in creative marketing. His work has been nominated for marketing awards such as Promax and The Telly's. He has produced and edited trailer for many blockbuster films and hit video games. He currently lives in Southern California with his wife, Natalie Horwitz - a non-profit professional in the Jewish community - and their daughter Elly. 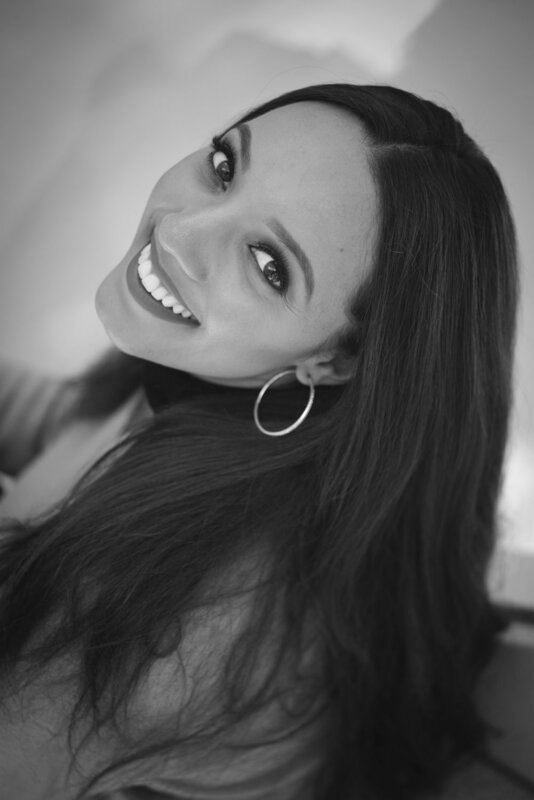 A versatile producer, writer and actor, Ashleigh grew up in Southern Texas before graduating from The College Conservatory of Music in Cincinnati, Ohio with a BFA in theatrical performance. She has been playing guitar and writing music since she was just 8 years old. Early in her career, upon moving to Los Angeles, Ashleigh produced two full length albums “Moving to Hollywood” and “None More Red" and toured as a solo singer/songwriter appearing on shows like Good Morning Arizona and Good Morning Cleveland. Ashleigh went on to write and record another 17 songs and then shifted her focus to film production, writing, and acting. Ashleigh wrote, produced, and stared in A BETTER PLACE - a short film that won the Indi.com Hollyshorts Film Festival contest in 2015. Ashleigh also wrote, produced and directed the musical short film ASHES followed by another comedy short, A RESOLUTION. She currently stars as Elise in the hit comedy series ROM.COM on Cracked. She recently appeared in a national Honda commercial directed by Jason Reitman. Ashleigh has also been the face of other national campaigns including Gorilla glue, TV Guide, Hughes.net, GMC and Burlington Coat Factory and is the online spokesmodel for several companies including Southwest Airlines, Gnentech Access Solutions, and Verizon Wireless. Shane is not an Oscar-winning editor in the making...and he brings over 18 years of experience working in Hollywood as an editor for countless trailers and tv spots for major blockbuster movies and video games. His work has won numerous awards from the film trailer industry. Shane is also an accomplished short filmmaker in his own right, having been a top finalist for such contests as “Project Greenlight” for Matt Damon and Ben Affleck as well as the annual “Crash The Superbowl” commercial contest for Doritos. In fact, he finds the art form of short filmmaking to be more challenging and rewarding than feature films. Most recently Shane finished his own feature documentary film, HEX HOLLOW following THE WITCHCRAFT MURDER at Rehmeyer’s Hollow in Pennsylvania. Shane is a member of the senior staff at Hammer Creative, an entertainment-marketing agency in los angeles. Fran Harvey has been making movies and television for more than 20 years. As both a writer and show producer he was nominated for several TV Emmys and winner of Promax and Telly awards in drama, comedy and sports entertainment programming. He then joined the marketing arm of Fox Broadcast Network (FBC) with nationally televised shows such as Arrested Development, Cops, The Simpsons, Family Guy, 24, House, Hell's Kitchen and Glee. Fran was a founding partner and President of The Frenzy Agency. In 2014 Harvey took on the role overseeing on-set creative for the Tribune Media’s original programs. Currently Fran is Executive Producer of content including the 2017 tv series "Movies For America", on which there is a notable appearance by actress Anna Paquin ( Jan, 2018). He is also Executive Producer on several films including the award winning Comedy "Emojional Breakdown" (USA, 2017), Power Shift (USA, 2018) and the TV Series Coming Soon ( 2018). Marisa is a recent graduate from Loyola Marymount University in Los Angeles, California, where she obtained a degree in Film and Television Production as well as a minor in Film Studies. She is pursuing a career in production design and hopes to improve her work by gaining valuable and diverse experience on sets as a production designer, art director, set dresser, or art department assistant. She became involved in production design in 2013 and has loved every minute of it. The majority of her work has been on short film projects but in the coming years she is looking to expand her resume to include commercials, TV shows, music videos, and feature films.